The IDF is showing off its new Trophy "wind jacket" tank defense system Tuesday with its first appearance in a joint combat exercise. 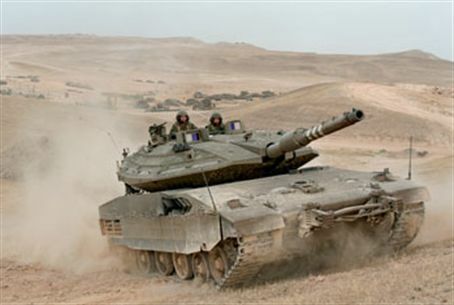 The IDF is showing off its new Trophy ” wind jacket" tank defense system Tuesday with its first appearance in a joint combat exercise at the southern Negev base known in Hebrew as Shizafon. Outgoing IDF Chief of Staff Gabi Ashkenazi and ground forces commander Major General Sami Turgeman will view the system, which will be demonstrated by firing a dummy missile at the tank. The exercise coincides with the end of training for tank unit soldiers who enlisted last March and for ground soldiers in an officers' course, including infantry, engineer, armored and artillery unit soldiers. The exercise includes urban warfare, advancing through complex obstacles, using artillery support and employing invasion techniques. It also involves aerial support by the Israel Air Force, including medical evacuations and aerial supplies. This demonstration kicks off a 10-day joint combat exercise that will feature live fire and test the inter-operability of the ground and air forces by displaying a combined battalion fighting in different operational settings.